Good morning everyone! I know, it’s Monday and all but as I said last week, this Monday just happens to be pretty special! We’re officially kicking off the Think Outside the Toy Box Summer Series today! That’s right! A full series. This week’s item? GLOW STICKS! How fun is that?! 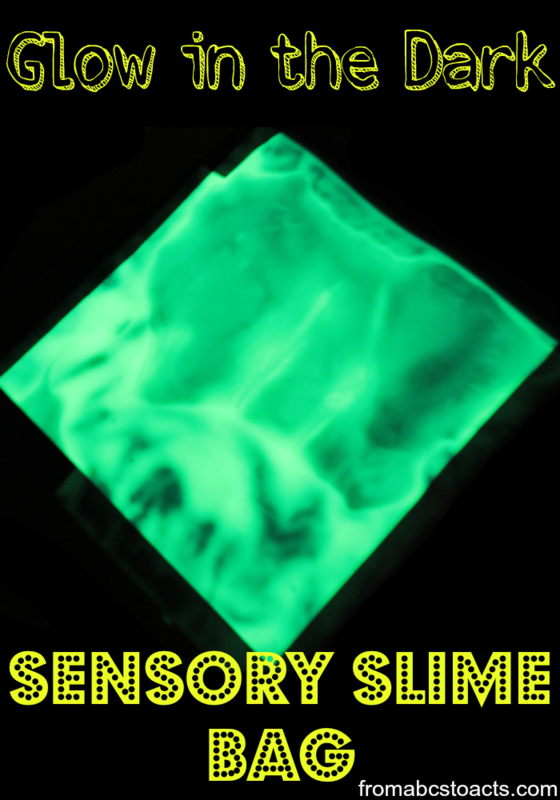 We turned those bright green glow sticks into a fun and squishy glow in the dark, sensory slime bag! This thing glowed for hours and kept everybody entertained for just as long. To make the slime, crack the glow sticks and give them a good shake so that they’re glowing nice and bright. Poke a hole into the bottom and pour the liquid into a bowl. Mix in your cornstarch. The amount will depend on the size of your glow sticks and the amount of liquid that was inside them but we used around 5 tablespoons of cornstarch. Basically, you’re looking for that perfect slime consistency. Not too watery but not mush either. Tape around 3 out of 4 sides of a plastic Ziploc bag leaving the opening clear. It doesn’t need to be pretty, it’s just an extra precaution to make sure your slime doesn’t leak out. Pour your slime into the bag, zip it up, and tape over the opening. You could spend some time just playing with the slime as it is. We used our fingers to draw shapes and numbers before moving to Q-Tips so that we could move the slime around. Or you can go ahead and flip off the lights for a brand new experience! The entire bag lights up and hours of fun sensory play can begin! Want more fun glow stick ideas? Check out these awesome ladies to see how they used them this week! For more fun ideas to try out this summer, make sure you check out the full Think Outside the Toy Box series! Have a fun glow stick post of your own? Link it up! We’d love to see it!